I started quilting this past September and finished my 2nd quilt last night. I tied this one as opposed to having it machine quilted (which I had done for my first one) so it took a little more time on my end but I am very pleased with it. I am taking it to quilt group tonight to show to the ladies there and then I will brave washing it tomorrow. It is very pretty Erica. I tied a couple of quilts a long time ago. Yes it takes quite a while. I usually have several projects going, because as much as I love quilting, doing the same thing day after day gets boring. If I can bounce around on different projects I feel more refreshed. 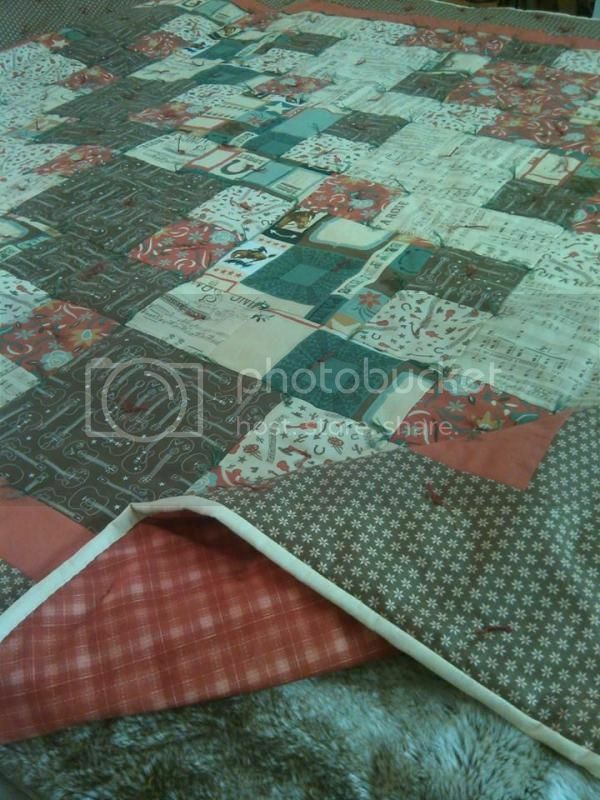 You are doing great, 2 quilts in about 7 months is not bad at all. If you are like me, you will probably slow down during the summer. Too many other things going on. I am glad you were bitten by the quilting bug. Your quilt is lovely, Erica. The fabric colors are so pretty. Your binding is so neat! !